Profit at Kangwon Land Inc, the operator of South Korea’s only casino resort open to locals, fell by 75.8 percent year-on-year in the three months to December 31, pressured by a decline in gaming revenue. Fourth-quarter net profit amounted to KRW19.05 billion (US$16.9 million), compared to nearly KRW78.39 billion in the prior-year period, the company said in a filing on Thursday to the Korea Exchange. 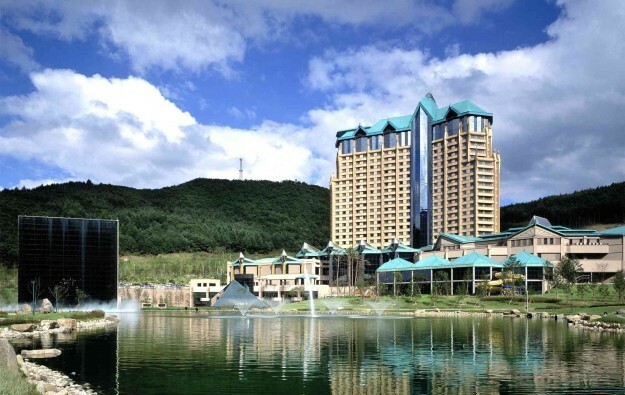 South Korean nationals are only allowed to gamble at Kangwon Land casino resort (pictured) in an upland area of Kangwon province – 150 kilometres (93 miles) from the country’s capital Seoul. Operating income for the period fell by 31.1 percent year-on-year, to KRW65.77 billion, said the firm. The casino operator reported sales of KRW351.87 billion for the fourth quarter of 2018, down 8.6 percent from a year earlier. That included gaming revenue of KRW312 billion, a decline of 9.5 percent from the prior-year quarter. The company reported declines in all of its gaming segments, with sales in the mass table segment falling by 8.8 percent year-on-year, to KRW155.3 billion. Revenue from slot machines fell by 7.3 percent year-on-year to KRW131.7 billion. Revenue from sales in the firm’s so-called “Membership Club” stood at KRW56.4 billion, down 13.6 percent from the prior-year period. Non-gaming revenue decreased by 1.2 percent year-on-year, to KRW39.9 billion in the three months ended December 31. The company did not give commentary on the quarterly results filed with the Korea Exchange, nor in a separate presentation published on its corporate website. Kangwon Land however noted that the aggregate number of customers to its casino resort in the reporting period fell by 12.8 percent year-on-year, to 680,737. The firm said additionally that its cost of sales increased by 4 percent year-on-year, to KRW225.2 billion. The Thursday filing showed that in the 12 months to December 31, Kangwon Land recorded aggregate revenue of approximately KRW1.44 trillion, down 7.1 percent compared to nearly KRW1.55 trillion in 2017. Gaming revenue for full-year 2018 declined by 8.3 percent, to KRW1.27 trillion, while non-gaming revenue grew by 3.6 percent, to KRW164.3 billion. The company saw its full-year net profit slump 32.1 percent year-on-year, to nearly KRW297.33 billion. The casino operator has been under political pressure to moderate the growth of its revenue. Kangwon Land has slimmed its daily opening hours since April 1, following an order of the South Korean government. The company was also ordered to reduce the number of mass tables, from a maximum 180 to a maximum 160, starting January 1, 2018.